If you’ve ever tried to contact Amazon to make a change to your account or modify an order, you might have run into some trouble. In fact, it can be difficult for users to even locate contact information for the ecommerce giant anywhere on its homepage. To assist you, here are several ways you can get in touch with Amazon customer service when you have a problem with your account. The Google search “does Amazon have a phone number” returns about 2,200,000 hits. The good news is that the answer is yes, they do. Amazon’s customer service phone number is 1-888-280-4331. And you can call that number 24 hours a day, seven days a week. But calling Amazon often comes with a wait, and it also requires you to have on hand a mobile phone that is paired with your Amazon account, as the customer service representative will send you a verification code via text message before you can commence asking your questions or sharing an issue. If calling seems like a hassle, however – even with the potential ease of voice-commanding a call on an Amazon Echo – there are other ways to contact the company. Often an online chat with an Amazon customer service rep is an easier way to get in contact with Amazon and to resolve an issue. Here’s how to do it. 2.Click “Contact Us” from the menu that appears to the right. 5.Click the button that appears with the word “Chat” to commence an online conversation with a customer service rep. 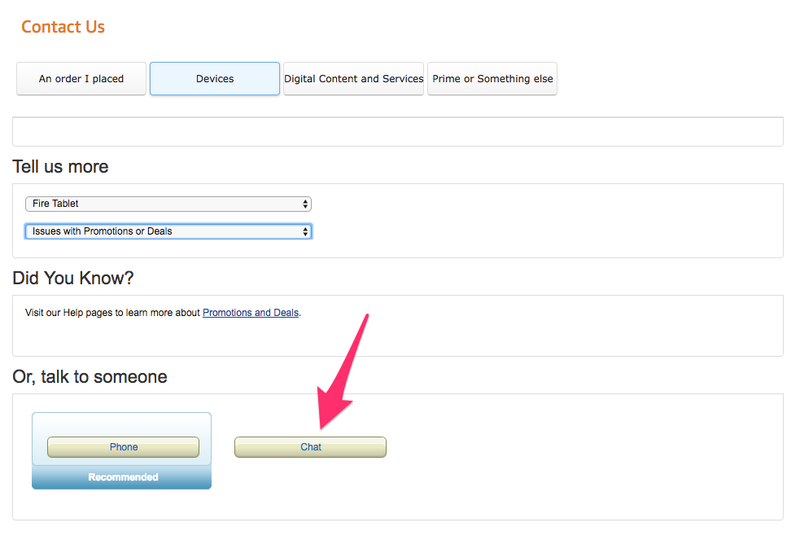 If you prefer to contact Amazon by email, there are two addresses to which you can send mail. But I’ve found that the response time is often 48 hours or even a bit more. That said, an email creates a record of your correspondence and thus might be the best method for some issues. For issues with your account, such as a billing dispute, you should email cis@amazon.com. For general inquiries, you should email primary@amazon.com. If your preferred method of communication is social media, you can comment, Tweet, or hashtag one of their several accounts. This is not the most efficient way to reach them, but it can allow you to air an problem, potentially drawing a more thorough addressing of the issue from the company. Amazon’s Twitter account is @amazon. Their Facebook page is www.facebook.com/Amazon. On Instagram, they’re – you guessed it – @amazon.